Toad in the hole is one of those real comfort food recipes that we all remember from childhood. It’s simple, uncomplicated and honest food, food which gives you a hug when you’re feeling tired at the end of a hard day. Growing up as a child in my grandmother’s kitchen toad in the hole was one of her staple recipes and our staple dinners. My gran cooked it almost every week, fresh sausages from the butchers, a light and crisp batter and lashings of thick gravy were always the order of the day when she cooked it. 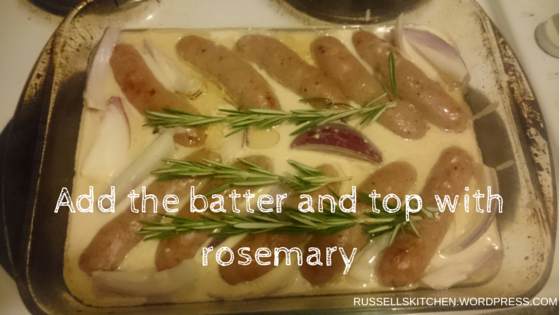 Toad in the hole represents the classic British food which she used to love cooking and eating, it was a meal which brought us all together around the kitchen table, the promise of that big dish of light batter and delicious sausages. It’s amazing how evocative the smell of different foods can be. Whenever I cook toad in the hole, the smell of it cooking takes me back to being that small child, tugging at my grans apron as she whipped the batter by hand – something you should do to get the best batter. My gran thought the making or breaking of any toad in the hole is the sausage which you use. I always opt for a classic butchers pork sausage. Though there are many different flavoured and seasoned sausages out there, I still don’t think you can get better than a good old butchers sausage. The middle of summer might not seem like the right time for comfort food, but let’s face it at the end of a particularly busy or stressful day or week, what’s better than some good old fashioned comfort food? For my money, there aren’t too many dishes which are better or more comforting than a toad in the hole. Sift the flour and salt into a bowl. Make a well in it and crack the eggs in, then start whisking together as you gradually pour in the milk. Once the batter is smooth, set it aside whilst you prepare the rest. Chop the onions as directed. Take a large shallow oven dish and add 2 tbsp of vegetable oil. Pop it in the oven at 240c/ 475f/ gas 9 to warm up. When the oil is hot add the sausages, pop back in the oven and roast them in the oven for 15-20 minutes or till they start taking on some colour. 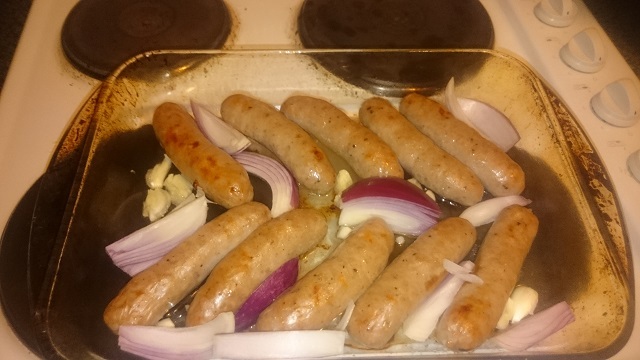 Take it out the oven and add the chunks of onion to the dish before pouring over the batter, making sure it is evenly distributed in all the spaces between sausages and onions. Lay the rosemary sprigs over the top. Pop it back in the oven for around 40 minutes. To make the gravy, soften the finely chopped onions (over a low heat) in a pan with 1tbsp of vegetable oil for 15 minutes. Add the gravy powder and an appropriate amount of hot water.